With the near collapse of the financial sector in our not-so-distant past, looking for trustworthy ways to invest has become trickier. One of the most reliable forms of investment has always been in one's own education. For many years, the AMGA has been providing high quality training and certification programs that build on a guide's experience. Those of you who have participated in AMGA programs understand that the courses and exams, while expensive, are a great value to you as a guide. In short, when you participate in an AMGA program, you are investing time, money, and a great deal of energy in your career as a professional mountain guide because you understand the benefits of certification. The benefits are too numerous to list, but here are a few: better guiding skills, safer client management, improved marketability, and increased wages. However, as smart investors, we should seek ways to improve upon our investment. Perhaps the most profitable return on becoming certified is increased freedom to work as a guide, either more days per year or in more locations. There are a couple of ways to achieve improved access for Certified Guides. One long-term objective is to work with land managers/agencies to recognize that credential-based access benefits the public and the agencies themselves. The AMGA has recently created an Access Director position which will work directly with the land agencies to promote the benefits of credential-based access and the AMGA. In the short-term, the Certified Guides Co-op (CGC) was formed out of the CGF to provide a means for a Certified Guide to augment their current work with guide services by, for example, providing immediate credential-based access to locations that are unavailable through the guide's employer. 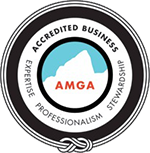 What would immediate credential-based access mean to a guide who has already invested in AMGA certification? Let's say you have $1,000 to invest. You could invest in a money market account that pays 5% annually. In one year – with interest compounded daily – your investment will earn you slightly more than $50. In 10 years, you will have netted almost $650. Alternatively, you could take that same $1,000 and use it to buy a share in the CGC - a one-time investment in your guiding future. And let's say that investment allows you to guide an additional five days per year, grossing $250 per day. Using this example, at the end of the year you will have earned $1,250 in addition to your normal guiding salary. This means your $1,000 investment netted you $250 your first year. If you calculate your added earning potential over 10 years using the numbers above, you would net $11,500 - not bad for an investment of only $1,000. Improving the earning potential is probably one of the best investments a person can make in the current economic climate. So, as the CGC seeks new members in the coming months, consider enhancing your investment in AMGA certification by joining the CGC.